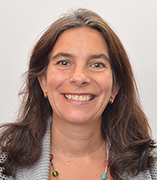 Catherine Main is a senior lecturer and program coordinator in the College of Education and a visiting scholar on the Early Investments Initiative with the Institute of Government and Public Affairs (IGPA) at the University of Illinois. She earned a BS degree in Finance and Economics from Marquette University in 1987 and a MEd degree in Instructional Leadership from UIC in 1992. She has more 25 years of work on behalf of young children and their families in the state of Illinois. Her work at the UIC College of Education has included innovative and responsive program development and coordination in Early Childhood Education. Main designed and developed a Blended Early Childhood/Early Childhood Special Education program and an Early Childhood Alternative Licensure program. Both programs were the first of their kind approved by the Illinois State Board of Education (ISBE) and both reflect a focused, much needed, response to specific demands for early childhood teachers in Chicago. Currently she is also the principal investigator (PI) the McCormick Foundation on an Early Childhood Workforce grant where she co-leads the Illinois team on the Innovation to Incubation (i2I) project with the National Academy Medicine (NAM) and the co-PI on the Chicago Mercantile Exchange (CME) Group Foundation grant, Math Access for Teachers and Family Child Care Providers. She regularly presents her work at national conferences and as an invited speaker at local conferences. She also serves on several advisory groups and boards including the Illinois Early Learning Council Program Standards and Quality Committee, the Chicago Community College Child Development & Human Services Program Advisory Board, and is a member of the Illinois Articulation Initiative Early Childhood panel. She is co-chair of the Illinois Higher Education Learning and Professional Development Work Group, President of the Illinois Association for Early Childhood Teacher Educators (ILAECTE) and a member of the board for Chicago Youth Centers. Main developed and administers the Blended Early Childhood/Early Childhood Special Education Program, which prepares teachers to work with all children regardless of ability and ages birth to 8 years of age, and the Early Childhood Early Certification Program. She primarily provides in-school instruction for teacher candidates. She teaches courses that emphasize collaborating with families, community members, and professionals for early childhood and special education, teaches primary grade methods courses and student teaching seminars in early childhood education.